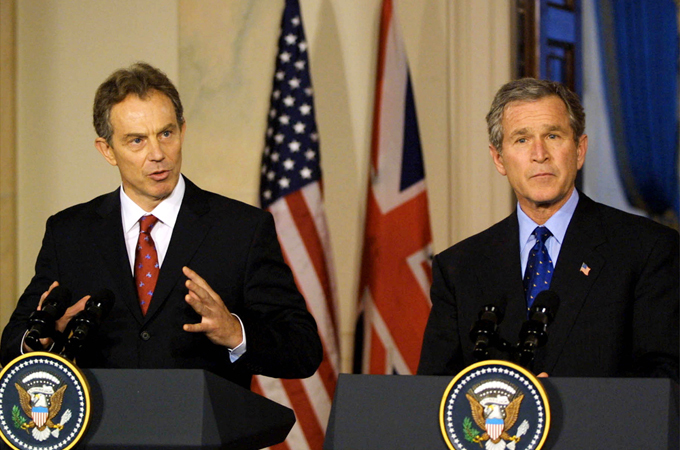 The KLWCT added two “Orders” to its verdict that had been adopted in accordance with the charter of the KLWCC that controlled the operating framework of the tribunal: 1) Report the findings of guilt of the two accused former heads of state to the International Criminal Court in The Hague; and 2) Enter the names of Bush and Blair in the Register of War Criminals maintained by the KLWCC. This vision of a revitalised struggle against war and post-colonial imperialism was comprehensively set forth in Mahathir’s remarkable anti-war speech of February 24, 2003, while still prime minister, welcoming the Non-Aligned Movement to Kuala Lumpur for its thirteenth summit. Mahathir stated clearly on that occasion that his intention in criminalising the behavior of aggressive warmaking and crimes against humanity was to bring relief to victimised peoples – with special reference to the Iraqis, who were about to be attacked a few weeks later; and the Palestinians, who had long endured mass dispossession and an oppressive occupation. This dedication of Mahathir to a world without war was reaffirmed through the establishment of the Kuala Lumpur Foundation to Criminalise War, and his inaugural speech opening a Criminalising War Conference on October 28, 2009. On February 13, 2007 Mahathir called on the KLWCC to prepare a case against Bush and Blair, whom he held responsible for waging aggressive warfare against Iraq. Mahathir, an outspoken critic of the Iraq War and its aftermath, argued at the time that there existed a need for an alternative judicial forum to the ICC, which was unwilling to indict Western leaders. Mahathir was in effect insisting that no leader should any longer be able to escape accountability for such crimes against nations and peoples. He acknowledged with savage irony the limits of his proposed initiative: “We cannot arrest them, we cannot detain them, and we cannot hang them the way they hanged Saddam Hussein.” Mahathir also contended that, “The one punishment that most leaders are afraid of is to go down in history with a certain label attached to them … In history books they should be written down as war criminals and this is the kind of punishment we can make to them”. In his 2007 statement, Mahathir promised that a future KLWCT would not, in his words, be “like the ‘kangaroo court’ that tried Saddam”. Truly, the courtroom proceedings against Saddam Hussein was a sham trial excluding much relevant evidence, disallowing any meaningful defense, and culminating in a grotesque and discrediting execution. Saddam Hussein was subject to prosecution for multiple crimes against humanity, as well as crimes against peace, but the formally “correct” trappings of a trial could not obscure the fact that this was a disgraceful instance of victors’ justice. Of course, the media, to the extent that it notices civil society initiatives at all, condemns them in precisely the same rhetoric that Mahathir used to attack the Saddam trial, insisting that the KLWCT is a “kangaroo court” or a “circus”. The Western media, without exception, has ignored this proceeding against Bush and Blair, presumably considering it as irrelevant and a travesty of the law, while giving considerable attention to the almost concurrent UN-backed Cambodia War Crimes Tribunal prosecuting surviving Khmer Rouge operatives accused of genocidal behavior in the 1970s. For the global media, the auspices make all the difference. In 1976, the Lelio Basso Foundation in Rome established a Permanent Peoples Tribunal that generalised on the Russell experience. It believed that there was an urgent need to fill the institutional gap in the administration of justice worldwide that resulted from geopolitical manipulation and resulting formal legal regimes of double standards. Over the next several decades, the PPT addressed a series of issues ranging from allegations of American intervention in Central America and Soviet intervention in Afghanistan to human rights in the Philippines’ Marcos dictatorship, the dispossession of Indian communities in Brazil’s Amazonia state, and the denial of the right of self-determination to the Puerto Rican people. Unlike KLWCT, the tone and substance of the formal outcome of the WTI was moral and political rather than strictly legal, despite the legal framing of the inquiry. For a full account see Muge Gursoy Sokmen’s World Tribunal on Iraq: Making the Case Against War (2008). All these “juridical” events had one thing in common: The world system of states and institutions was unwilling to look a particular set of facts in the eye, and respond effectively to what many qualified and concerned persons believed to be a gross injustice. In this regard, there was an intense ethical and political motivation behind these civil society initiatives that invoked the authority of law. But do these initiatives really qualify as “law”? A response to such a question depends on whether the formal procedures of sovereign states, and their indirect progeny – international institutions – are given a monopoly over the legal administration of justice. I would side with those that believe that people are the ultimate source of legal authority, and have the right to act on their own when governmental procedures, as in these situations, are so inhibited by geopolitics that they fail to address severe violations of international law. The KLWCT has its own distinctive identity. It has the imprint of an influential former head of state in the country where the tribunal was convened, giving the whole undertaking a quasi-governmental character. It also took account of Mahathir’s wider campaign against war in general. The assessing body of the tribunal was composed of five distinguished jurists, including judges, from Malaysia, imparting an additional sense of professionalism. The chief judge was Abdel Kadir Salaiman, a former judge on Malaysia’s federal court. Two other persons who were announced as judges were recused at the outset of the proceedings, one because of supposed bias associated with prior involvement in a similar proceeding, and another due to illness. There was also a competent defense team that presented arguments intended to exonerate the defendants Bush and Blair, although the quality of the legal arguments offered was not as cogent as the evidence allowed. The tribunal operated in strict accordance with a charter that had been earlier adopted by the KLWCC, and imparted a legalistic tone to the proceedings. It is this claim of legalism that is the most distinctive feature of the KLWCT – unlike comparable undertakings that rely more on an unprofessional and loose application of law by widely known moral authority personalities and culturally prominent figures, who make no pretense of familiarities with legal procedure and the fine points of substantive law. In this respect, the Iraq War Tribunal (IWT) held in Istanbul in 2005 was more characteristic. It pronounced on the law and offered recommendations on the basis of a politically and morally oriented assessment of evidence by a jury of conscience. The tribunal was presided over by the acclaimed Indian writer and activist Arundhati Roy, and composed of a range of persons with notable public achievements, but without claims to expert knowledge of the relevant law, although extensive testimony by experts in international law did give a persuasive backing to the allegations of criminality. Also, unlike KLWCT, the IWT made no pretense of offering a defense to the charges. Tribunals of ‘conscience’ or ‘law’? It raises the question for populist jurisprudence as to whether “conscience” or “law” is the preferred and more influential grounding for this kind of non-governmental initiative. In neither case does the statist-oriented mainstream media pause to give attention, even critical attention. In this regard, only populist democratic forces with a cosmopolitan vision will find such outcomes as Kuala Lumpur notable moves toward the establishment of what Derrida called the “democracy to come”. Whether such forces will become numerous and vocal enough remains uncertain. One possible road to greater influence would be to make more imaginative uses of social networking potentials to inform, explain, educate, and persuade. He is currently serving his third year of a six year term as a United Nations Special Rapporteur on Palestinian human rights. The views expressed in this article are the author’s own and do not necessarily reflect Al Jazeera’s editorial policy.